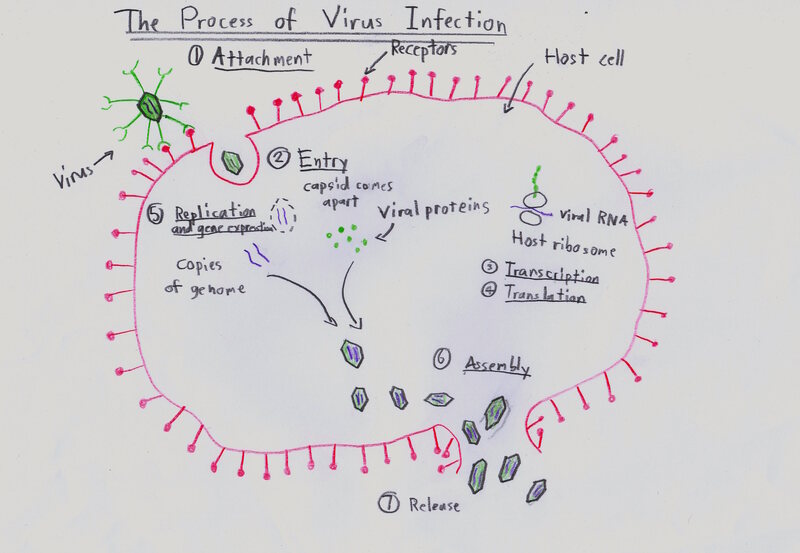 I have drawn a diagram of “The Process of Virus Infection” (my diagram is on the bottom). Viruses are cells that infect animals, plants, and bacteria and reproduce only within living cells. Viruses are considered as being either living organism or inert chemicals. The first step of virus infection is attachment. The Host cell has receptors on the cell membrane. In order for the virus to infect the Host cell, the virus needs the right receptors to match the Host cell receptors. Then it enters the host cell if the virus receptors match with the Host cell. Then the capsid of the virus comes apart. Then it transcripts and translates the viral proteins and copies the genome. And then assembles and releases many virions in the process called “Lysis”. A virion is the complete form of a virus when it is outside a Host cell.